Without a doubt, 2014 has been a year to remember for many reasons. I remember this time last year while at home on P.E.I. thinking of what the new year would bring. I knew it was going to be an exciting and crazy one, and it certainly did not disappoint. There was so much hype and build up to the Sochi 2014 Paralympic Winter Games. Between finishing to write previews, doing interviews, watching the Olympics and figuring out the logistics of the trip, the first three months were filled with go, go, go. I was pretty excited to say the least. Mind you, it was pretty difficult actually getting to Sochi, (Sochi 2014 blog) but we made er there, jetlagged and all. Russia and Canada are very different. The sights, the air, the language…everything. Don’t get me wrong, I thought it was pretty cool to be there and met a lot of cool people and did a lot of cool things. My favourite memories of the year came from Sochi, Russia even though it’s a tie for first place. 1a: Talking to Canadian sledge hockey forward Billy Bridges on his journey to his bronze medal at Sochi and growing up on P.E.I. Even thousands and thousands of miles away, my home province will forever be in my heart. I will admit, at the end of that interview, my eyes were a little misty. 1b: Seeing the look on Russian sledge hockey captain Dmitry Lisov’s face when he saw me in Sochi. It was after a big win against the U.S. in round-robin play and I remember waiting a long time for Lisov to actually come to the print media for interviews as TV crews were taking such a long time. He and I had met in Toronto a few months earlier at a tournament, but when he saw me in Sochi, he leaped out of his wheelchair, practically giving me a hug. The world is a small place, there is no doubt about it. From Sochi, it was a few months of quiet. I didn’t tweet as often anymore, and just focused on wrapping up my third year of university at Ryerson. In the summer time, I made a bold move to stay in Toronto to work with the Ryerson Rams. I thought it would be a good experience to do a Toronto summer and it ended up working out quite well. I was able to do an in-person interview with Sportsnet for an internship there in the fall, and also got to volunteer for Wheelchair Basketball Canada at the women’s world championship. Not to forget, I also joined a new community in Toronto, Leaside, and their baseball association as umpire-in-chief. I had a really great time meeting new people and spending most of my summer on the ball fields. I also became good friends with my summer roommates and to this day we are still close friends. One of the highlights of the summer was umpiring the Bantam Triple-A eliminations in Mississauga, Ont. We did three-man crews for those games and it was a great experience with lots of really good baseball. I ventured home three times this year. Once at the end of April-early May, a road trip with my buddy Chris “Brucie” Thompson in August and then at Christmas. The roadie with Chris was a ton of fun. It’s a long trek to get home, but we made the most of it. In late-August I decided I would try out for the Ryerson Rams baseball team. I haven’t played competitive baseball since my latest concussion in 2011, so almost five years. During the summer, I became close with a guy named Toby Kerr, who I broadcasted with for Ryerson and worked alongside at Leaside. He and I would pitch to each other throughout the summer in case I did decide to tryout. I was a final cut for the team, but don’t regret trying out. If I wasn’t in my fourth year, if I had of played ball during the summer, and I had of gotten a couple of breaks from my defence in the tryouts, who knows what could have happened. Things always seem to work themselves out though. On Sept. 2, I started my internship at Sportsnet working on its website. I tried really hard to bring new ideas and stories to the team. I think at times I was trying to force the issue, but hey, I was only going to be there for six weeks, right? On Sept. 11, I applied for a position at The Canadian Press after noticing a job posting. I did not envision anything coming of it, but emailed the sports editor there regardless to reintroduce myself. 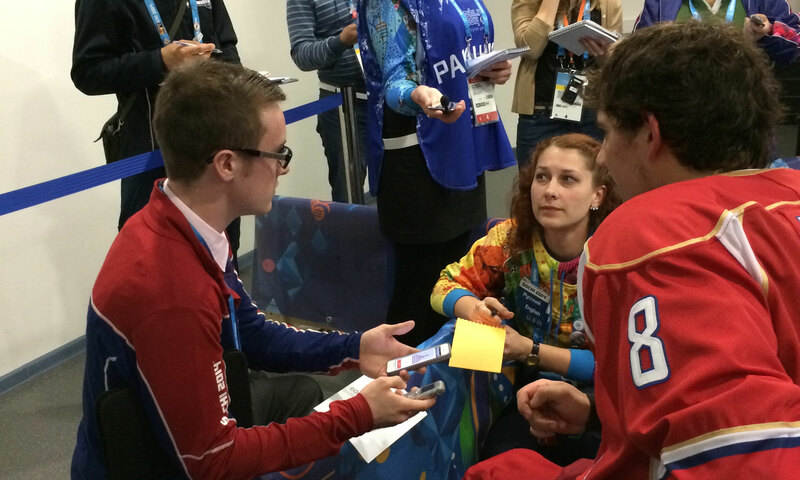 After Sochi, the CP reporter that was at the Paralympics introduced me to the editor and I made that connection. The next day I was asked to come in for an interview for the following week. A couple weeks later, and I was signing an offer letter. It was truly a really exciting moment for me in my young career. I have always been a big fan of what The Canadian Press does and to be a part of their team is truly a blessing. The day before my offer from CP, I received another offer from Sportsnet to work on their NHL team with the hockey season fast approaching. Between, CP and Sportsnet and working as the newsroom manager/managing editor at The Ryersonian (Ryerson’s school newspaper as one of my classes), the next few months have flown by. I’m very thankful for everything that has happened in 2014. I predict 2015 will be just as exciting with lots of new memories to share. I’m lucky to have a family that supports me and loves me for my goofiness.